French violin of Mirecourt, F. Barbé, 1911 - Violins, Mirecourt / probably J.T.L. Many traces from playing incate this antique French violin has a long musical biography, this marque F. Barbé violin was built in 1911 in Mirecourt, most presumably in the world-famous workshops of Jérôme Thibouville-Lamy (JTL), as many typical features of premium JTL-instruments may indicate: The wide Stradivari model features flat archings, a delicate purfling and a wonderful back that was made in two piece, covered by a beautiful golden-brown varnish. With marks and scratches (that are consaidered in the price) but undamaged and in excellent condition, it was worked over in our workshop and made ready to play, with a new fine quality boxwood setup. 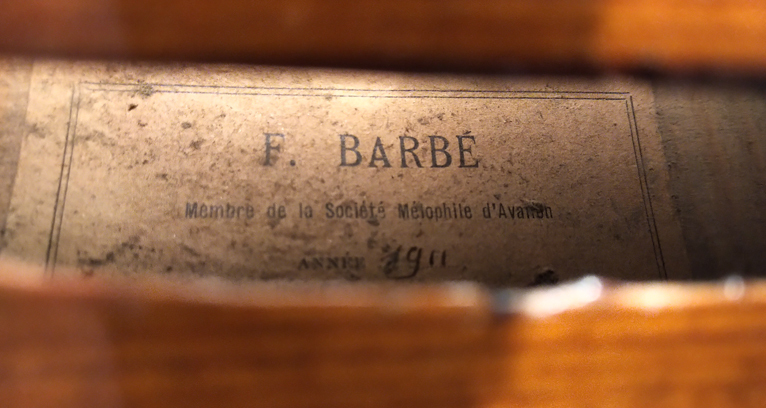 The sound of this F. Barbé violin in is full of character, mature and warm features excellent resonance.